Can you say Unit Train? Just finished weathering these 12 aluminum coal gons for a client. That makes half of his order complete. Yes he has 12 more to go. But Pierre needs a little break from coal gons. These are an interesting car. With the exception of a few appliances, they were built as an all aluminum car. Significant savings in weight. As they aged the bolsters were replaced with steel bolsters which were riveted in place. Can't weld steel to aluminum. I suspect that they found that the aluminum bolsters weren't taking the shocks very well. Aluminum is useful stuff, but it has one problem. The weld is weaker than the base material, which can present problems at stress points. There's a reason why airplanes aren't welded. .
Smokey Mountain Model Works offered these kits a while ago and they rate a solid "not bad". The pattern work is very nice. The history in the instructions is well researched. Decals were offered for the as built red lettering and the later green lettering. Some useful hints were provided for painting. The older cars showed, in prototype photos, a distinct brown hue, while the relettered cars had just lightly oxidized metal showing. All the interiors would have been very bright, as coal is very abrasive as it's unloaded. The model interiors were painted with Scalecoat Aluminum. The green lettered cars were Floquil Bright Silver with an overspray of light gray and the red lettered cars were Floquil Old Silver with an overspray of Rail Brown. Once the lettering was all applied and sealed with flat finish, the undersides were were dirtied with Rail Tie Brown overspray and the ends and sides were dusted with Grimy Black. Coal is filthy stuff after all. I'm rather pleased with how these have turned out. Hope the client is as well. I need to build a few boxcars now. Sort of a system reboot! My friend, Mark Hill, was over yesterday. Hadn't seen him in almost a year, and I can't remember the last time he actually saw the layout. We spent a pleasant day catching up, trading war stories and running trains. Nothing structured, just the joy of watching long freights rolling along the main line. Westbound Extra 1157A meets Train #82 at Delhi. As we went along, I realized that I'm actually closer to being able to run things with TT&TO than I had first thought. Track is all in and mostly debugged. There's a few little things that pop up. Might take an hour to address. I have a few cars that refuse to remain on the tracks. The reasons are not immediately obvious, no doubt another couple of hours will resolve those issues. If all else fails, there's no shortage of freight cars here. The only "big job" left is to create a dispatchers work area. I've been giving the whole thing a lot of thought and I have decided that I want to give the dispatcher an aid for tracking the train locations. I'm thinking that a magnetic board with a track schematic and magnetic labels for the trains will be of great use for helping to visualize where all the trains are at any given time. There will be times when it will be quite hectic on the layout and a visual representation will go a long way to avoid cornfield meets. Went into Toronto yesterday to help out my pal Trevor on his layout. We prepped mounting provisions for his cloth valance and mounted his labels on the layout fascia. After the work was done we ran a freight extra into Port Rowan and out again. It's a real joy to run on Trevor's layout. It works perfectly! And looks stunning. I could study his ground cover for hours. Once that was done it was off to Harbord House to deal with the beer surplus that we'd been warned about. The new feature on Trevor's layout that I wanted to make special mention of is the ambient sounds he's added. Trevor has placed a number of sound modules and speakers about the layout. From them come the sounds of a variety of birds, cicadas, burbling brooks, mooing cows, etc. It's all random and just the right volume. After listening for a few minutes, I knew that Trevor had it right. What I was hearing was the same sounds I hear on my front porch on a hot July day. Trevor has both an eye and an ear for detail. This little beauty came into the shop today. It's an O scale CPR Fowler stock car kit created by Chooch Enterprises a few years ago. Sadly, it seems to be out of production, along with all the other Chooch resin kits. The master for this car were created by Bill Yancy. His work is stunning! Tongue and groove in the floor boards! Who does this? It's details like this that tempt me to change scales. That's so cool! There has been a thread on yahoo.com/group/Proto-Layouts, that has left me thinking that there are still people who don't fully get the point or potential of Free-Mo/Fremo. As I write in the following article, which was published in RMC back 09, the point is mainly to be able to get together and create "layouts" that wouldn't otherwise be possible. The Fremo events are not public events, but there solely for the pleasure of the members to be able to run trains and view each others work. It's not there as public "show" piece. "Hey Johnny look at the cute trains" is not the driving force. The standards of workmanship are high and achieved, in large part to insure that nobody is disappointed because someone wouldn't follow the wiring standard, thus shutting down the entire setup while the source of factory smoke is located. Hopefully these images can in part, give a sense of the scale of the setup. 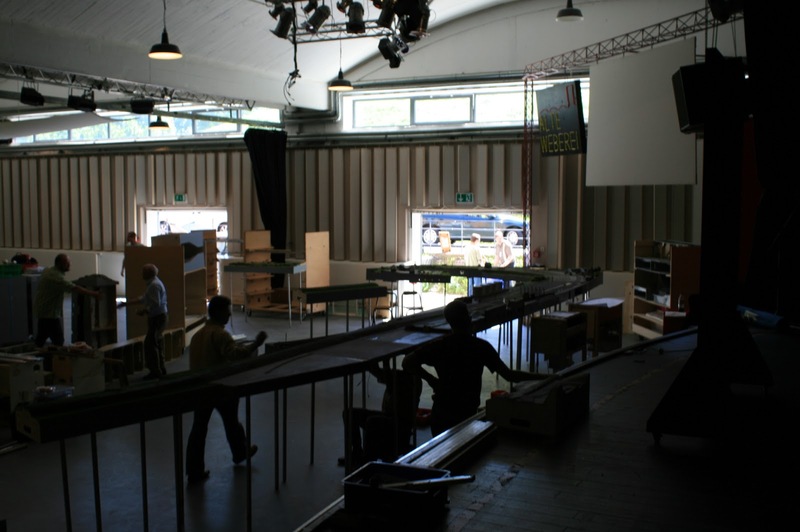 For 3 ½ days over the last weekend of May 2009, I had the pleasure and privilege to observe and participate in a large Fremo meet in Nordhorn, Germany. 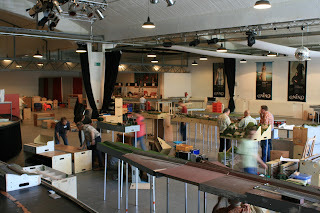 Fremo, which stands for, Freundeskreis Europäischer Modellbahner, which roughly translates to Circle of friends of European Modelrailroaders, is a 28 year old association of over 1200 modelers from Greece to Norway and Finland to Spain and is the forerunner to North America’s Freemo movement. As well as setting standards for module design and construction, Fremo is responsible for organizing the setups and publishing a periodical magazine and a couple of very well executed promotional pamphlets. With the annual dues set at 37.50 Euro ($52.00 US approx.) I’d say it’s a good bargain. Fremo maintains a website. http://www.fremo-net.eu/. On it you will find all of their standards as well as photos from many of the setups. It is mostly in German, but some pages are translated. The photos alone are worth looking at. The meet setup design was created and plotted by Dirkjan Kaper, who using the Fremo design database, which has every members module plotted in CAD, spent almost 3 weeks generating the layout plan. The end result was a layout with some 300 metres (975’) of mainline formed from the 208 modules that were brought by 35 of the members of Fremo for this meet in the 21 metre x 36 metre (117’ x 68.25’) room. Dirkjan then spent another 2-3 weeks creating the timetable for governing the movement of the 160 trains that were run in 4 hour operating session. I was told that this setup was of a modest size compared to past events and that for the 30th anniversary in Oct 2010, over a kilometer of mainline is being planned for. I may have to return to Europe just to see that. 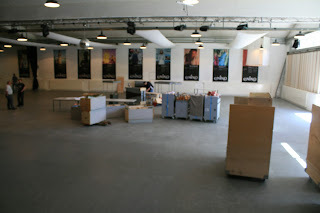 I don’t think that the photos can properly portray the sheer scope of the setup. It has to be seen to be truly appreciated. In that regard it’s interesting that these setups are not generally open to the public. It is for the pleasure of the participants. The system used is similar to the Timetable and Train Order system of controlling trains, with a little more authority for the station masters, patterned after German prototype practices as well as the familiar car card system for moving individual freight cars. Some 23 station operators were required to control the train movements of the 160 trains that were run during the session. All stations and towers were connected by telephone. Up to 15 trains were running at any one time. Using a 6-1 fast clock a 24 hour period was represented in a 4 hour operating session. 2 sessions a day were run on Saturday and Sunday and one session on the Monday. Given that European homes tend to be smaller than the North American counterparts and basements as we know them are a rare thing as well, it is to be expected that group modular model railroading such as Fremo is as successful and popular as it is. I don’t know of too many home layouts that can offer the scale of operations that a Fremo setup can. Control for the layout is based upon the Digitrax Loco-net protocol, with lots of either home built or small after market manufacturers components. One interesting feature of the control system used by Fremo is that there are individual handheld throttle units for every locomotive. With space being at a premium in the smaller European locomotives, hard programmed decoders make far more sense than the programmable units we use in North America. Unlike North American Freemo standards, Fremo does not require a UP-5 type unit in every module or module set. 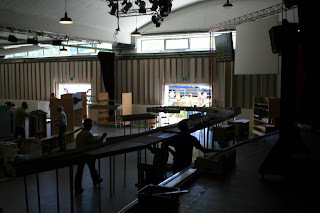 But rather during setup a crew goes around the layout with plugin boxes that clamp to the layout and are then daisy chained together, with as many plugins as required then placed in key locations. A very sensible approach I feel. As one would expect the overall quality of the modeling is very good. Modules were there in varying levels of completion, which allows one to see different work methods and material choices. Always a bit of a learning experience viewing other peoples efforts. The lighting conditions in the hall made some of the photography difficult, but I hope that the images printed will give an idea of the quality of the work being done. A couple of module sets, I believe warrant special mention. The station set of Rothenburg, built by Michael Baensch, Stefan Tilke, and Gordon Bickner, is a set of modules about 12 metres (39 feet)long representing a medium sized station on a double tracked main line. It is fully signaled, following German practices, with lots of urban structures flanking the station building itself. The platform is fully illuminated and I neglected to count the number of figures waiting on the platforms(hundreds I’m sure). The station set of Truedelburg, built by Thorsten and Dieter Petschailles, is a medium sized station and junction built on a 100 degree curve. It is designed to receive traffic from both the double track mainline as well as 2-3 single track branch lines. Both of these sets can be well seen on the track plan. 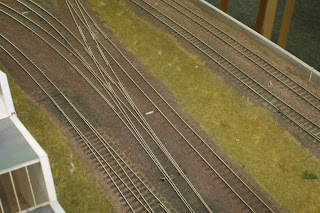 The best rural scenery on the layout had to be Steiles Eck. Gordon Bickner has done an excellent job on this long curved cut through the German forest. Hundreds of commercial trees have gone into this beautiful set of modules and the little human touches help bring it to life. The 2 hunters on the fire break chatting before continuing the hunt. The shepherd in the shade under the bridge watching his flock grazer on the floodplain. I mention these three not to take anything away from the rest, but more as examples of the overall high level of execution all the modules shown. Mean while in the other room. A smaller Fremo setup and operation was underway. N scale finescale. This layout showed some of the most impressive workmanship I’ve ever seen. These fellows have developed a functioning scale European style coupler. There’s a photo-etched stainless steel item which represents the loops and turnbuckle as seen on the prototype and they use a hand held magnet to lift the item and drop it on the hook of the adjacent car. It works very well and looks right. The trackwork by Henk Oversloot, is some of the best trackwork I’ve ever seen. It’s all done by hand, no filing jigs or tools. Hard to believe that it’s N scale. When you look at the photos, remember it is indeed N scale. I knew that when I decided to accept the invitation to travel to Germany and take part in this event I was going to see some very fine modeling. What impressed me even more was the gracious reception I as an overseas visitor received and willingness to accommodate my lack of language skills in their native tongues. Equally impressive was the high level of mutual respect shown by all. At one point during an operation session there was an electrical equipment failure in a station, resulting in a shutdown of a key junction point. Trains very quickly started to back up. While the owner of the modules tried to establish the exact nature of the problem and repair it, the train crews all waited quietly and patiently for the problem to be resolved. No smart comments, ribbing or heckling. Just a collective confidence that the problem will be resolved as soon as possible. Nice to see. I’d like to again thank all of the Fremo members who attended Nordhorn for their hospitality and the warm reception I received while there. There are no borders when we share the love of trains. As part of the fallout of my blogging about how unhappy I was with some of the castings that I had received recently, the kit maker took me to task a little for airing my concerns on my blog. So let's understand a few things. I deliberately avoided naming names. I feel that would have been going to far. I also did state that the kit maker was taking immediate steps to address the problem. And I'm very satisfied with the new parts. There seems to be a major reticence these days to say anything negative about the products we pay good money for. See this editorial by Ben Hom from Jan, 04. I completely concur with Ben's position. When I started my other business, Yarmouth Model Works, I was asked what credentials I had as a resin kit manufacturer. My response was, " I've now built hundreds of resin kits over the years. In many scales, with a large variety of kit quality. I know what I want to see when I open a kit box and that is what I'm putting in my kit boxes." And there are times when it's not easy to maintain the standards I desire. But I persevere and I will push others in the same direction. The technology exists to produce very good kits and models, and the consumer is entitled to demand it. There is no excuse for poor work. I feel no regrets for showing unacceptable parts online. It gives modelers a chance to see potential pitfalls and it gives me a chance to compliment the kit maker when they make good on a problem. Spent the morning creating Popeye forearms.At least the right arm. In the paint shop are 10 S scale Canadian grain hoppers, which I'm painting, decaling and weathering for a client. The client supplied me with dry transfer decals for the cars. They are the only thing available in S for the cars he desired. Now I really don't care for dry transfers. They're like contact cement. You get one shot to get things in the right place. And if the transfer is a little old the adhesive doesn't grab well onto the model surface. Also, I'm not fond of putting a lot of pressure on the sides and ends of models, continual rubbing can produce some very undesired results in model surfaces. In this case the transfers were a good 10 years old. Even though sealed in envelopes some of the markings were being cranky about transferring. My preferred approach in this case is to transfer onto clear decal film and then apply the lettering in the conventional wet slide manner. But it does involve a lot of prep. The decal sheet has to sprayed with a flat finish to insure that the transfers adhere. Once all the markings are in place the sheet has to be again sprayed, with gloss, to seal and protect. And then the decals can be applied to the model. So the preparation of 10 sets of decals has actually taken 6 hours of spraying, rubbing and more spraying. My right arm is at this point a little out of sorts. So we rest the arm until tomorrow and then proceed. This morning a box arrived in the mail with 2 sets of replacement sides for the reefers I'm working on and blogged about earlier. The replacements are as close to perfect as one can expect. The kit maker is to be praised indeed for his quick resolution of the problem I had with the first set of sides. In spite of my earlier complaints about the castings I received, I am very much looking forward to building these 5 cars. The Canadian 8 hatch reefer is a signature car and has received much attention over the years. S scalers are indeed fortunate to have these cars available to them now and I know that other variations of the basic design are coming in the future. 2 of the cars I'm building will be finished for the Newfoundland Railway, which will be different in of it self. The kit design shows a lot of thought and the level of detail should please most modelers easily. More when the cars are done.